6 Notes, Swiss Precision Music Movement. 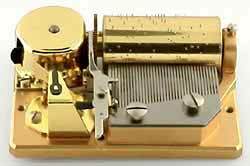 Same Specifications as the 72 Note movement, but with two melodies per cylinder. 85 x 60 x 25 mm. Melodies: Minuet ( Mozart), Minuet (Boccherini). Music movement Swiss made 18 notes, spring wound with pull string & plastic cover. Melody: Augustine, size 60 x 48 x 30 mm. Music movement Swiss made 18 notes, spring wound with pull string & plastic cover. Melody: How many stars, size 60 x 48 x 30 mm.